The New York design world is always busy. Keeping up to date on all the news can be tough, which is why we're here to give you the Weekly Roundup, a one-stop-shop for everything you need to know. According to a report in the Washington Post, Amazon is reconsidering its move to a new campus in Long Island City after significant backlash from the general public. Governor Cuomo treated the initial announcement of the new Amazon HQ as a boon for job creation in the city, but locals feared the development would cause home prices to skyrocket in Queens, one of the last affordable boroughs in an already pricey city. The annual showcase for Brooklyn designers will move to the Navy Yard's Building 77 for NYCxDesign this May. BROOKLYN DESIGNS is accepting submissions for exhibitors now. Retail giant Sears has been to the edge, and is now on its way back. It had one foot in the grave when the New York South District Court ruled today that the ex-CEO of the company would be allowed to buy the bankruptcy debt, putting the company on track to begin its recovery process. The long-awaited TWA Hotel at JFK Airport will start taking reservations on February 14 in advance of its May opening. 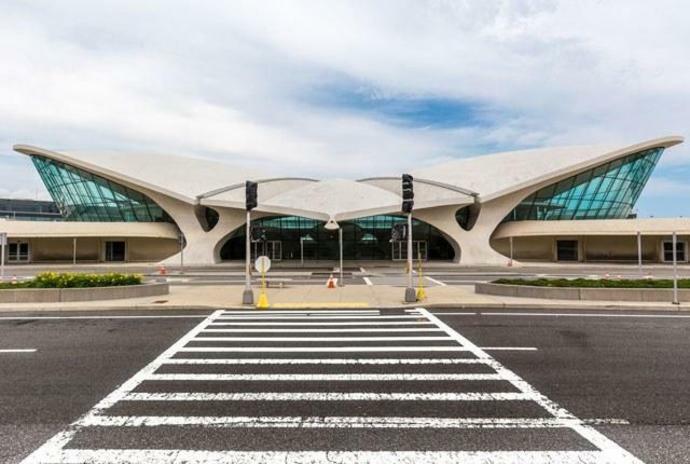 The hotel will revive the iconic Eero Saarinen-designed TWA Flight Center, which will now act as the lobby and check-in desk. The Upper East Side townhouse of the former first lady and activist is up for sale. Located at 211 East 62nd Street, the four-bedroom, five-bathroom home was occupied by Roosevelt between 1953 and 1958, though at the time, it was split up into separate apartments. It could be the perfect buy for a client looking to experience a slice of New York history. For all the talk of stocks breaking out to new highs, most of the FAANG stocks are not among them. This earnings season could be a turning point. We rounded up the most comfortable kicks that will look great in your travel photos, too. The e-commerce giant&apos;s entry into the industrial-supply market appears to have curtailed margin at traditional companies -- which is bad news for the industry&apos;s valuation. Two of the world&apos;s premiere retailers are battling for the hearts and minds of shoppers everywhere.